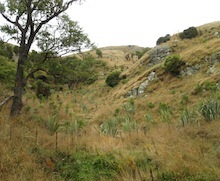 Join us for autumn maintenance to look after the plants at Mahoe-nui Bush, a patch of remnant forest on the Port Hills behind Sumner. What to bring. Please wear gumboots or sturdy boots (gumboots are best if it is wet or dewy as the site is covered in long grass). Please bring a drink bottle, warm clothes, a rainjacket etc and a snack. Equipment. Equipment is provided but feel free to bring your own gardening gloves and hedge clippers if you have them. Kids welcome, although they would need to team up with an adult. How to get there. Drive up to Evans Pass (behind Sumner) and turn right onto the Summit Road and after 900m park on the left. The site is fenced and you will see the plantings. There is limited parking so would be great if you could carpool with some others if possible. Location of the site: maps.google.co.nz/maps. For directions and maps, please click here. Further information. Please click here for more info, or contact Helen (helenhills.mcp@gmail.com, 03 981 4617, 021 023 26155) or Vicky (vickysouthworth@gmail.com, 021 029 70450).